Discussion in 'iPhone and iPad Games' started by reikos, Aug 10, 2015. 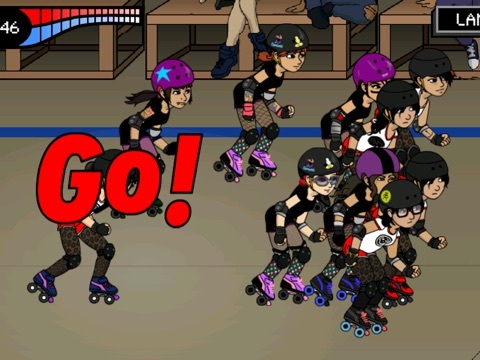 Join the crudest gang of the cutest skater gals in town! an action/adventure game not for spoiled brats. 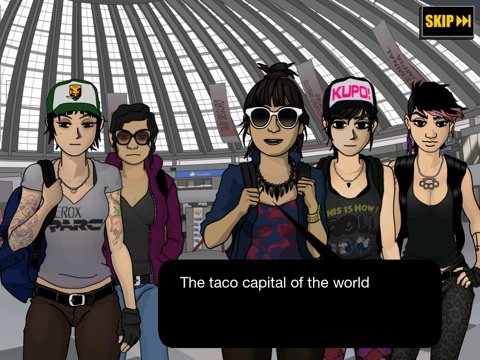 Life is not easy for Marlene, that moved to a new city to attend college and struggles to pay the bills, but things will get a lil uglier when she met Rita, the leader of the local Roller Derby team, and get sucked into a mad plot to become the champs of the national league. ● Delicious rollerskating simulation gameplay. This is not a dumb "endless runner". ● Challenge the girls of 5 REAL TEAMS from the Mexican Roller Derby League ● A pumping soundtrack from your local bands and all the spirit of ROCK AND ROLL! ● NO IN APP PURCHASES, if you want to win this game you'll have to pay in tears and sweat. yeah the controls may alienate some people, give em another try. As for jumping, your not supposed to do both movements at the same time. the run movement gives you momentum, you don't need to do the run nonstop, you'll deplete your stamina. from the trailer, i like the story and the artwork is lovely! If you tell me how is the gameplay, gonna buy this! Fun game! Just bought a copy. The artwork is very nice, btw. thanks pal the gameplay is physics based, you use a left swipe to apply impulse, and swipe up to jump, more impulse the faster you go. the game can be faster but have. thanks pal its super nice to hear you like it! Really loving the game, I have gotten the hang of the controls and after level one the coke power ups are explained this game is NOT easy it's a great challenge and the art is beautiful, thanks a bunch! Bought it, Played it and like it! My only complain would be the controls, they are a bit unresponsive but that's fixable, otherwise funny little game, well worth a dollar! Thanks for the code. I'm really enjoying this game a lot. Love the cartoony look and the story. I don't have a problem with the controls at all. Game is challenging and fun. Good luck with the game. It's a winner. Thanks bro i hope this one doest crash that hard, i really want to ditch this stinking office job and start making games full time!